Family 1 : William BISHOP Sr.
1860 Clay County, KY Census, Sexton Creek Precinct. 1900 Owsley County KY Census, Booneville Precinct, District 1. PAGE: HH 250/257 or 286/293. Based on age of last child born to Rachel. Extracted Owsley Co. birth records for 1904. Jackie Gatwood, daughter of William Lamb & Lillie Tyree. Ann died in the Peoria State hospital and was transported to Henry, IL, her home of 42 years, to be buried. -Obituary. Daughter, Mary Ann Mangan, a former school teacher, spelled her mother's maiden name as McKindley. Others have spelled it McKinley. Perhaps McKinley was the Americanized spelling. Jacklyn Thomas Flannery, grt grt granddaugh of Ann McKindley and obituary in the Henry, IL paper. Jacklyn Thomas Flannery, grt grt granddaugh of Ann McKindley - 1912. From a family history written by Taylor P. Gabbard, grandson of Ann McKindley. 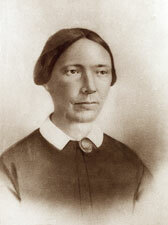 Ann married John Downey after she arrived in America about 1856. 1910 Owsley Co. KY Census says: 4 children, 3 living. Elijah Thomas' pension record - Dec 11, 1882. 1900 Owsley Co. KY Census, Island Cr. Precinct, P. 15B HH 33 - Dec 1882. 1910 Owsley Co. KY Census by Robert L. Smith, Buck Cr. Precinct.